^ "2010 Boston Red Sox Statistics". Baseball-Reference.com. Retrieved 2018-06-13. ^ Chicago Cubs [@Cubs] (8 December 2015). "It's official! 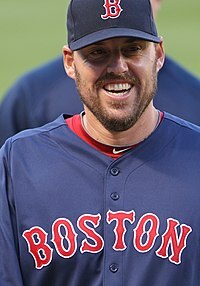 #Cubs and RHP John Lackey have agreed to terms on a two-year deal" (Tweet) – via Twitter. 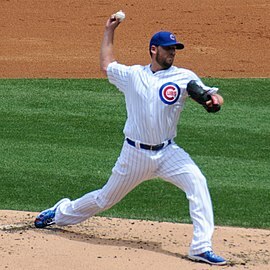 ^ "Chicago Cubs at St. Louis Cardinals Box Score, April 18, 2016". Baseball-Reference.com. Retrieved 2018-06-13. ^ "2016 Chicago Cubs Statistics". Baseball-Reference.com. Retrieved 2018-06-13. ^ "Cincinnati Reds at Chicago Cubs Box Score, August 16, 2017". Baseball-Reference.com. Retrieved 2018-06-13.